Unite staffer Dan Carden has been selected to replace Steve Rotheram as Labour’s candidate in Liverpool Walton, one of the party’s safest seats. Rotheram announced his intention to stand down as an MP after successfully winning the Liverpool Metropolitan Area Mayoral election on Friday. Seeing off competition from Liverpool City Mayor Joe Anderson and North West MEP Theresa Griffin, who were the preferred candidates of the party’s right, Carden, 30, will inherit Steve Rotherham’s majority of 27,000. Dan Carden was born in Liverpool, where his father Mike Carden was the shop steward during the dockers’ strike in the city in the 1990s. He has recently worked for Unite General Secretary Len McCluskey. “Being selected to stand as Labour’s candidate in Liverpool’s Walton constituency is the proudest moment of my life. It’s the pinnacle of a journey I could not have dreamed of. When my dad first explained to me, when I was just eight years old, that he had been sacked for refusing to cross a picket line, this lit the flame in me that has fired my dedication to the service of working people. “I am 30 years old, from a different generation with different experiences but I know that only Labour is on our side. I’m ambitious for what the Labour Party can do for our people, for this country as a whole. Only a Labour government will transform our economy, redistribute wealth fairly from the few to the many and give hope to communities like ours. “As Walton’s MP, I will work day and night to make sure that our schools are funded, our young people are supported to reach their potential, our hospitals function, our homes are affordable, our skills are valued and our vulnerable are cared for. More than anything we need real jobs that are secure and well paid, quality apprenticeships that give young people hope and a future to look forward to. 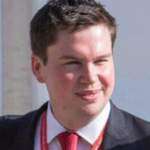 Carden’s selection by the NEC in Walton is the latest of the party’s selections, with the nomination deadline for all candidates in the General Election looming on Thursday. This week the NEC allow took the decision to replace Rochdale MP Simon Danczuk, who was suspended and thus ineligible to stand, and has since resigned from the party. NEC Officers selected former Manchester Mayor, MP and PLP Chair Tony Lloyd. Yes, of course they would because we know some of them are Tories themselves in all but name, and look no further than war criminal Blair for your proof. Odd then, that the then Conservative leader, Michael Howard, opposed the Afghanistan war. I’ve never met Dan, but I did know his dad during the Liverpool docks two year lockout and in the aftermath when the Casa was being set up out of the minimal payments some of the lads finally got, top bloke, and if Dan takes after his dad Walton is in safe hands, although I bulk at the description of anyone who works for a union as a ‘trade unionist’, to me (as someone who also works for a union) a trade unionist is a lay rep on the front line who has to face down hostile bosses when their job could be on the line as a result, and having spent decades as a lay rep myself before becoming a bureaucrat I know full well what the difference is (and it is huge). And so I do have some reservations that Dan may not have actually served a proper apprenticeship but I’ll give him the benefit on that for now. I know the other two that were on the shortlist too come to that. Theresa has always been ok, soft leftish and had union support. As for Joe Anderson, it’s a shame he has made some negative comments, as while I respect Joe for standing up against the Liverpool fascists, in terms of his role as Liverpool mayor (which really should now be abolished – how many blinkin’ mayors do we need!) and his record as a councillor it has been pretty dire and amounts to cut after redundancy after cut after redundancy after cut, followed by having a pop at Corbyn for good measure. Sorry Joe, that’s not what we want or what people in Walton need. Good result. I was dreading that the pompous, “power crazy” Joe Anderson would be selected. Best wishes to the next MP for Walton – Mr Dan Carden.